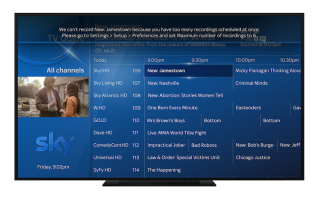 New Sky Q update allows you to watch and record more TV | What Hi-Fi? Sky Q has had its fair share of updates since launch, the arrival of 4K content and voice search to name but two. The latest addition is another extension of the box's recording functionality. Originally, you could record four channels and watch a fifth. Then you could record five while watching a sixth. Now, if you happen to have a recording schedule so busy that six recordings overlap, you can breathe a huge sigh of relief. You can now record that sixth programme and even watch a seventh channel live. How do you enable this new feature? When your box attempts to record that sixth channel you'll automatically be prompted to alter your settings. It's done by going into the menus, down to Settings, to Setup, and through to Preferences. Here you can change the set the 'maximum number of recordings' option to six. You'll then be prompted to reset your Sky box to complete the process. The new feature doesn't come without a couple of small all sacrifices, though. You won't be able to use the Sky Sports split-screen feature, and the Mini Guide will show a static image on the homepage instead of a live one. If you're firmly attached to these features, you can always dive back in the menus and revert back to the original settings. Sky Q is expected to see more updates during the course of 2017, including Dolby Atmos and voice control - as soon as they're launched we'll be sure to report back with our findings.